Philip A. Hart Plaza in downtown Detroit, along the Detroit River. It is located more or less on the site at which Antoine de la Mothe Cadillac landed in 1701 when he founded Fort Pontchartrain du Détroit, the settlement that became Detroit. In 2010, the Detroit-Wayne County Port Authority opened its new cruise ship passenger terminal and dock at Hart Plaza, adjacent to the Renaissance Center, which receives major cruise ships such as the MS Columbus. 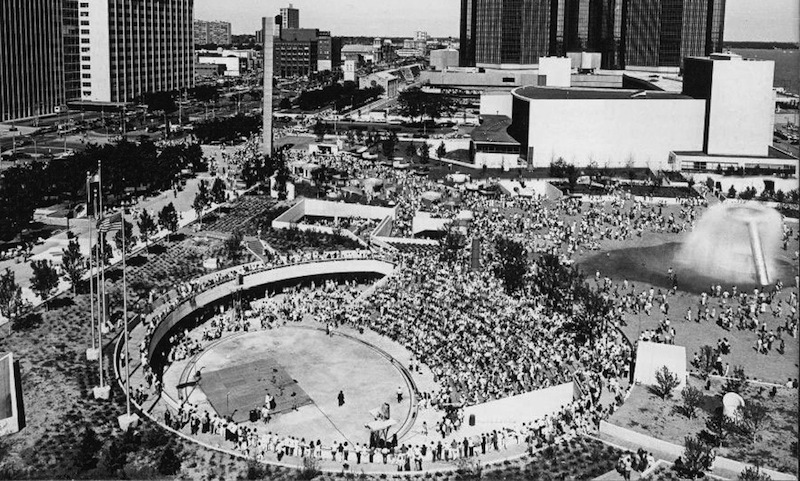 Lying immediately south of the intersection of Woodward and Jefferson Avenues, it is the focal point for festivals and public demonstrations of all kinds. The 14 acres (5.7 ha) plaza, which is named for the late U.S. Senator Philip Hart, opened in 1975 and has a capacity of 40,000 people. At the center of the plaza is the Horace E. Dodge and Son Memorial Fountain, designed by Isamu Noguchi and Walter Budd in 1978. Downtown Hoedown 05/06/1983 Hank Williams, Jr.